We are a recognized exporter and supplier of Knitted Cotton Fabric based in Narayanganj, Bangladesh. Good quality cotton is woven to produce this 100% guaranteed knitted cotton fabric. 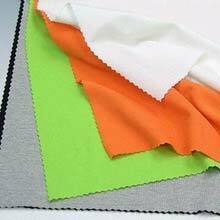 The fabric we offer comes in different bold colors. The soft fabric is versatile and can have a number of uses. We offer competitive prices on bulk orders. Our good packing ensures deliveries on time and in good condition.